The mild flavors of leeks and the potatoes compliment each other so well. I like mine pureed, but if you like it a bit chunky you can use a potato masher instead of an immersion blender to give you bigger chunks. This is ready in under 30 minutes and can be made gluten-free. If you wish to make it dairy free, simply leave the milk out and add more broth. I made this soup a few times now and absolutely love it. Thick, creamy, and tasty. I usually eat it with crackers instead of bread, but still tastes amazing. Soup was OK. It lacks a depth of flavor. After tasting I added some Herbs de Provence mix and let it simmer for a few more minutes which helped. I made this and we all loved it. Great recipe. Very easy to make. Thank you. I used 5 cups vegetable stock & no milk to make it vegan. Delicious! 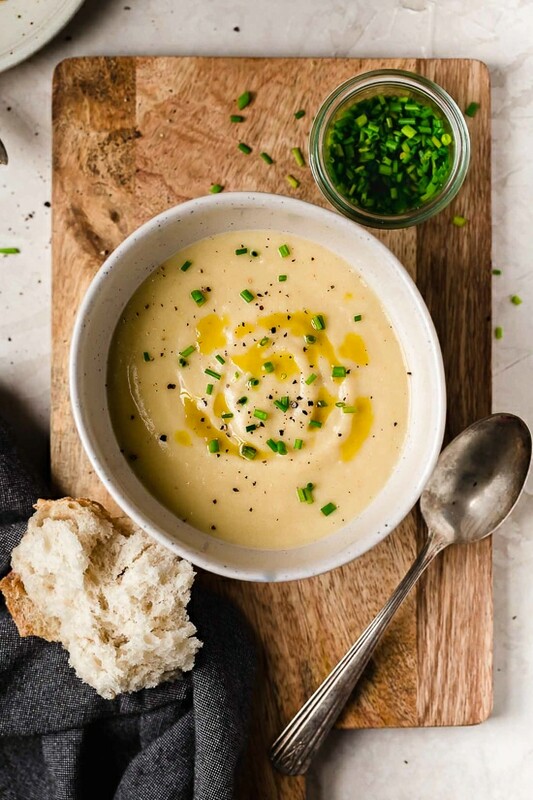 We like a thicker potato leek soup and this one fit the bill. Since we drink skim milk that is what I used along with vegetable broth and a large shallot. Also added a shake or two of lemon pepper when seasoning. Might top with shredded cheese before serving next time! Made and reviewed for the WOTM recipe tag game. Very disappointed in searching for Potato LEEK Soup. Yes onions can be substituted but then you should call it Potato Onion Soup. It was okay but in searching I found other better skinny recipes for Leek Soup. I was so excited to try this recipe & am glad I gave it a go tonight. It was easy to make & so tasty! I used homemade chicken broth in mine and found the soup to be comforting and satisfying. Thank you for yet another winning recipe!???? As a twist I added a large can of clams, liquid included, for a guilt free “Clam Chowder”. Yum. This recipe is amazing! It was soo delicious! This sounds delicious and I plan on making this tonight. However, what would I serve with this to add some protein? Is this soup intended to be the whole meal (because that’s how I prefer to roll–lol–but lack of protein means I’ll be hungry soon after)? Especially when I’m trying to make fast and simple meals. I have time tonight, but most nights I’m in a hurry. My first thought with creamy soup is grilled cheese but that rather defeats this healthy road I’m trying to follow. I have no dietary restrictions (though chicken is not my favorite source of protein). I’d love to hear suggestions for a simple, tasty protein-packed dish to serve with this soup. I’m thinking of adding in a can of white beans to up the protein content. Especially since you puree it, I am thinking that it won’t make too much of a difference in taste or texture. When I made this a few months ago I had the same concerns. I added Turkey sausage before serving. It was a win at my house! I made this tonight and my husband and I both loved it. 5 stars! I made no changes to the recipe, just added salt and pepper and a little shredded cheddar on top. We served with warm naan bread. I’m so glad you have this recipe I’ve been thinking about this soup. About how many cups are 4 medium leeks once they are washed and cut? Can this be made in a slow cooker? How would I do that? Just made this soup last night and it was a HUGE hit with the family! Do you think this soup can be frozen? I tried this today with GF flour blend, came out very thin and also had little flavor. I added a bit of cornstarch and thyme, dill to season. We’ll see if that helps. Perfect, warming winter recipe! Adding to my autumn eating list immediately! This is delicious! Thank you, Gina for another winner!I like to add a scoop of FF Greek Yogurt to my bowl when I sit down to eat. It adds a nice creaminess and a bump in protein. My husband likes to sprinkle some crumbled bacon in his bowl. Excellent recipe, I do like the addition of the onion for added sweetness, and found the ratio of potato to leek gave a creamy soup. With other recipes I have struggled for the proper consistency. I am making this soup again today for a dinner party. Loved this! On my second week of making to supplement my work lunches. Super easy to make. I’ve been halving the recipe and using the halved recipe as five weekday servings. I also sprinkle with a tablespoon of cheddar after heating! I’m using yukon gold potato instead. Can you provide the weight (or how many cups?) of the potatoes used instead of the number? Also how many cups of leeks? I buy frozen leeks from Trader Joe’s. Delicious! Does this freeze well? This is wonderful. Just made it this evening. Would never know it is a healthy recipe as it is rich and quite filling. This is definitely a keeper. I love soups and usually have a bowl daily. I’m especially fond of pureed soups. This is delicious. I almost ate a second bowlful. 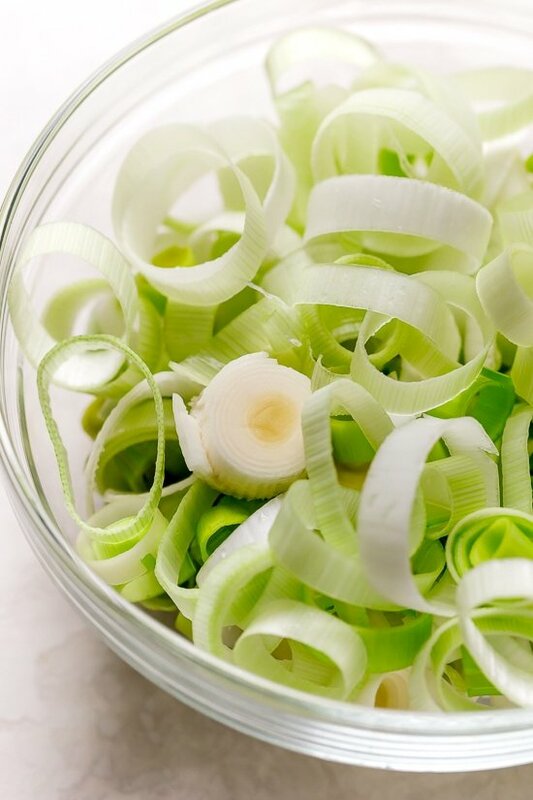 If leeks are not available, could you substitute with extra onion? I Love Love Love this soup!!! I made this last week (I added nonfat greek yogurt at the end) and it was amazing!!!!!!!!!! I had it every day for lunch at work and I already want to make another batch!!! Hit the spot! I love potato soup and this was creamy and delicious. Cannot wait to have leftovers tomorrow. How would this work in an instant pot? Perfectly! 20 mins and done. How long would you cook this in the Instant Pot? I cooked 20 minutes and then used the immersion blender. Worked perfectly! I made this soup tonight and it’s wonderful! I love how simply it was seasoned and yet it has just the perfect balance. Thanks for so many wonderful recipes you’ve created. 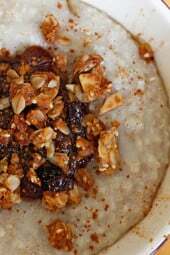 You are my go to for all recipes. I’ve ordered your new book and I’m looking forwarded to its arrival tomorrow! You were spot on in the fact that this is so simple yet tastes so complex! I followed another commenter’s suggestion and added 1/3 brick of light cream cheese and the texture/flavors was fantastic. I think I’ll make this again next week and double the recipe. Another hit, Gina! Great recipe! My husband and I enjoyed this for lunch today….and we’ll get to enjoy it again tomorrow. 🙂 Thanks! Hi Gina, on your weekly menu this week, it says for dinner on 10/8: D: ¾ cup Potato Leek Soup (5) but here it says 1 1/2 cup 3 points. Can you please clarify? I noticed this too. I just emailed her to see what she says. Making this tonight and after looking over all these reviews, I am so excited. Its a snowy day here and it will be a perfect dinner! Thanks Gina! My husband whipped this up for me last night to take to work. It’s delish!! I absolutely love leeks so I was really excited to make this, especially on a cold fall day. I really enjoyed it! My husband said “it reminds me of mashed potatoes” but he said that was a good thing and he ate it all. I gave 4 stars cause I do think it needed a little “something” else, but still very good as is! I did add a pinch of smoked paprika as mentioned in other comments and also a little hot sauce to my bowl at the end (i add hot sauce to most soup I eat). I will definitely make it again, but I think I’ll leave it chunkier next time and possibly add turkey (or regular) bacon! This is the BEST soup recipe! I’m slightly addicted to soup. I omitted the milk and added an extra cup of vegetable broth. I also added to jalapenos. This tastes just like the fabulous jalapeno potato soup I had in Europe. Gina, I absolutely love your recipes! Always so easy and flavorful. Trying the chicken tacos tonight. I also appreciate that you are WW friendly. 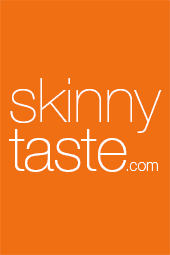 I have 4 friends that I’ve introduced Skinnytaste to and they love it as well. Made it for dinner tonight. Everyone loved it!! Hearty and filling soup full of flavor. Thanks Gina!! This soup is delicious! Just made it for dinner this week, and it came out really good (husband and I had to have a bowl for lunch it just smelled so good). I used cashew milk instead of 2%, and the consistency is spot on, and flavor delightful. Definitely going in the rotation! This soup soothes the soul! The weather has been so dreary lately with the forecast predicting more chilly weather and rain. 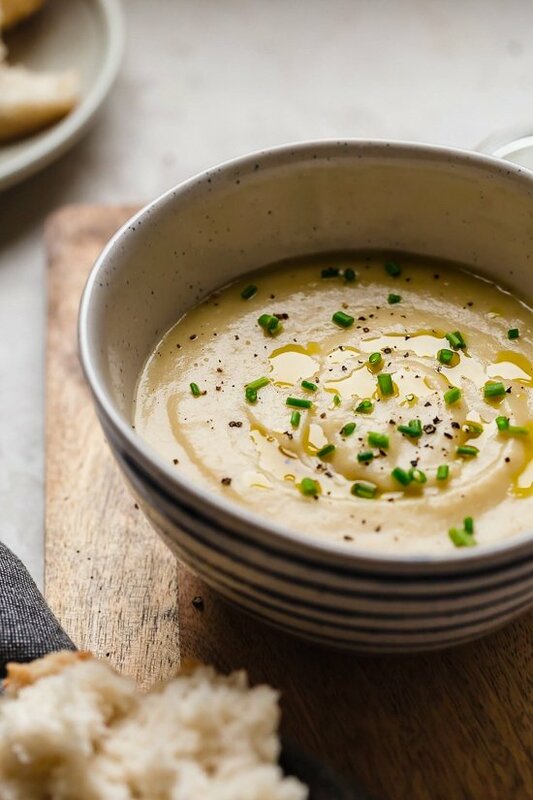 I have been searching for a soup that is both comfort food and healthy and this is it!! I am sure I will make this through the remaining fall and winter! 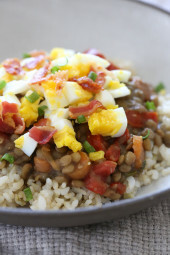 Making this for tonight, but I’m experimenting by putting it in the crockpot. I’ll bring it to a boil on hi and then turn it down to low for the rest of the afternoon. Keeping my fingers crossed. Glad to see that the serving is actually 1 1/2 cups rather than just 1/2 cup! Made this tonight after having a horrible migraine all day. It was quick, easy (thank goodness) and delicious! My picky fiancé even said that we should have it again! ? I only puréed half of the soup, because aforementioned fiancé doesn’t like purée anything. I also added three celery stalks. One-pot wonder of a cozy recipe! Never mind! Just realized i skimmed over the milk at the end! Oops! 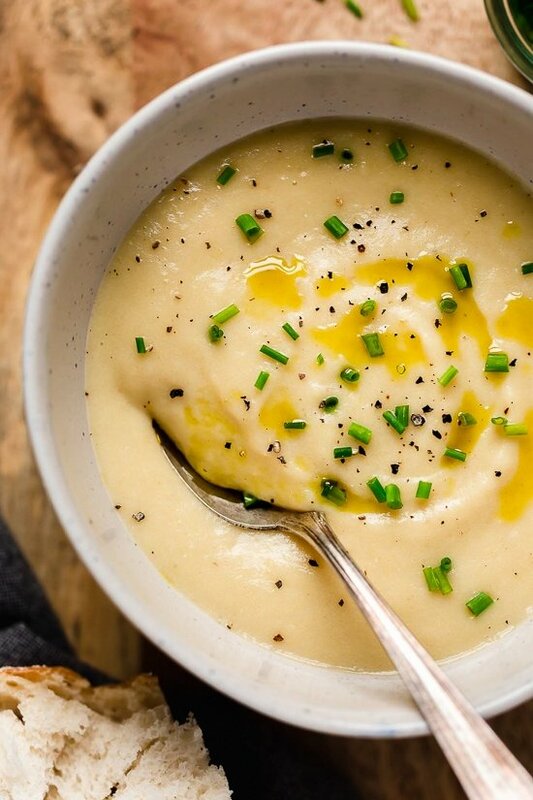 Has anyone tried using cauliflower instead of one of the potatoes, wondering if the soup would still be as good. Let me know! It’d be nice to have more of the soup for 3 points! Shouldn’t the serving size be 1 1/2 cups ? Yeah, pretty skimpy, especially when that 1/2 cup has about 1/5 of your total daily recommended sodium. Serving size 1/2 cup – 133 calories – YIKES! Who eats a 1/2 cup of soup?? For those on a ketogenic diet…I find subbing celery root to be the ticket!! Lower carb and lots of flavour with similar texture!! Serving size is a half a cup? Really? I noticed that also. This would be a small appetizer entree or side dish, then, instead of a main dish. Sally- I omitted the milk and added more vegetable broth. Also tossed in 2 jalapenos. I put in the recipe builder……1 point for 1 cup!! This looks so yummy, but as a diabetic, I try to avoid white potatoes. Do you think it would work with cauliflower replacing the potatoes? This recipe is a keeper! My familyl loved it, and I mean LOVED it. I made it with 2 leeks and 3 potatoes because that is what I had! Everything else was correctly measured, but I added 2 herbs, rosemary and thyme. I blended it with a potato masher instead of immersion blender. This is a no fail recipe! Making some to freeze next time! Loved its guts! Hi! I had the same question and so am curious if you tried it and if so, how it turned out with almond milk. I just made this using butter alternative and organic plain soymilk tastes amazing and the points stayed the same when I calculated- hope this helps! I used almond milk and it was fine! How long can this stay in the fridge? I am not a fan of blended soups, I like them a little chunky. Do you think this recipe would work if I removed the potatoes after they were done cooking and used a pasty cutter to mash the potatoes then add them back in? I just made this recipe.It is very tasty. I am not sure of the proportions. Should I have more leeks than potatoes? I used 3 good sized leeks because 4 seemed like too much. I had about twice as much of the leeks as potatoes. My favorite soup!!! 9 year old loves it too. I have a double batch cooking right now…again. Just made it two weeks ago. Hi Gina! 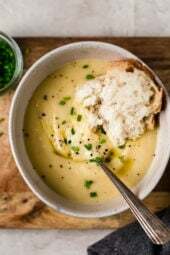 I had a gastric sleeve operation a week ago and was looking for soup recipes to try since I had clearance to eat homemade soup. 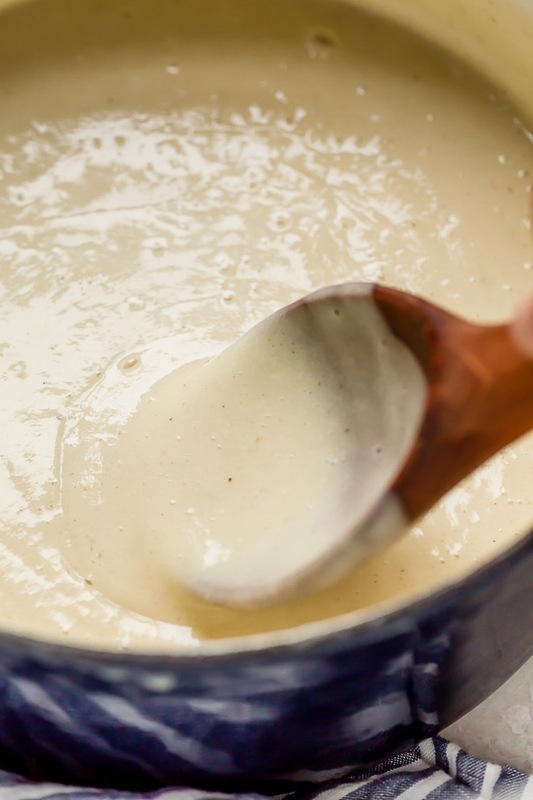 Your potato leek soup was one of the first recipes I found, so I shared it with my husband. He prepared it for me and it was delicious. Loved it! We made it with oat milk since I have lactose intolerance, but it worked perfectly. Hi Gina!! Thanks for this and all of your wonderful recipes!! Could you please tell me what you consider to be a MEDIUM sized russet potato? I want to make sure so I don’t accidentally go over points here. Thanks!! 2-1/4″ to 3-1/4″ inches in diameter. I go by weight. Weigh your potato’s so you know exactly how many points you’re putting into the soup. And this way you can make it exactly the same next time. This soup was fantastic. My husband and I both enjoyed it. This may be my new favorite Skinnytaste recipe! First, this recipe is restaurant quality good. Second, I’m sick with a super bad sore throat (even applesauce tastes too acidic and is hard to get down) and this really hit the spot! Plus, I could just throw the veggies in an alligator chopper, and whip this up fast, and without a lot of time in the kitchen when I don’t feel well. This would be great topped with a tablespoon of grated cheddar and/or a slice of crumbled center cut bacon. You’re welcome! I hope you feel better! While family enjoyed this soup (including kids aged 7 and 10). I served it with bread and roasted broccoli which might sound odd but actually turned out to be a good combo! Thanks for sharing your great recipe! This is on our meal plan this week and I'm so excited. 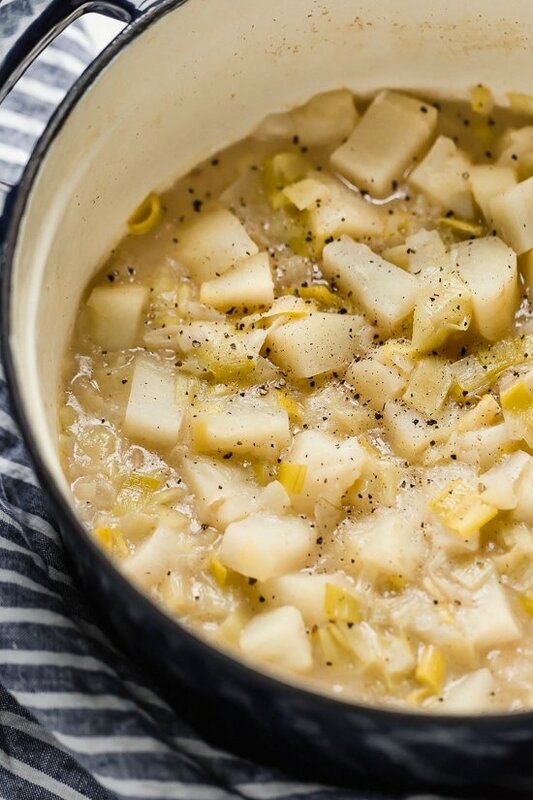 My father made leek and potato soup growing up and never shared the recipe with me. I can't wait to try this and share the recipe with my daughters as they grow. Amazing! Made this tonight and my husband loved it and he's a pretty picky eater 🙂 I did use skim milk but other than that I followed the recipe. We love healthy recipes that taste amazing and this fit the bill perfectly! I make this but instead of milk I throw in a brick of cream cheese. Makes it thick and hearty.